Awareness for the 22 veteran deaths a day by suicide was the theme for Saturdays 22 mile walk from Andrews to Murphy, NC. 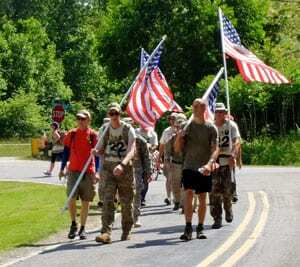 Over 50 veterans and patriots from three states aged 18 to 78 participated in all or various phases of the walk that was broken down into three 6 mile segments and a final 4 mile trek. The Warriors Veteran Outreach of Murphy sponsored the event and provided a BBQ cookout when the 9 hour walk ended at the Riverside Mountain RV Park run by Air Force veteran Gary Nickols. Cherokee County Veteran Service Officers, Sarah Jenkins and Jan Griggs, participated as well as veterans from North Carolina, Tennessee and Georgia. Dan’o Miller, founder of Warriors Veteran Outreach, started the event in Andrews with a prayer and followed the group in at the finish to make sure all were back safe. Family members, friends and hundreds of people cheered and honked their horns as the group made their way carrying the stars and stripes along the highway, through Murphy and into the RV park. The walkers were supported by dozens of people ranging from Murphy Police Dept, NC State Highway Patrol, Cherokee County Sheriff’s Office to radio operators from Fannin County Amateur Radio Group and Cherokee County Amateur Radio Emergency Service. Numerous area business sponsored the event with donations, food, tables, water and advertising. The 22 mile veterans suicide awareness walk was a great success. WarriorsVeteranOutreach.com.